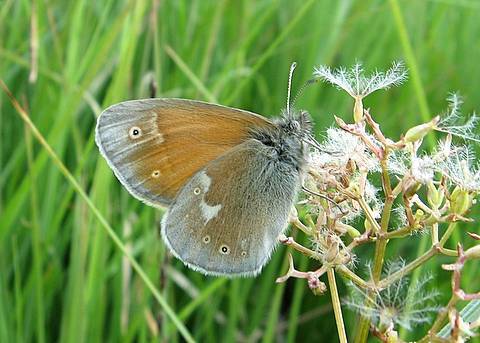 The Large Heath is a very local species flying only in damp places, particularly peat bogs, where the females lay on cotton-grasses. The habitat is readily identifiable in summer when the butterflies are on the wing as the fruiting heads of the food plant with their long, white cottony hairs are very conspicuous. The butterflies are incessantly active, bobbing constantly around the damp grassland and stopping only rarely to nectar on a marsh cinquefoil flower for example, like the one in the photograph above. Although they are a little larger than other heaths they do generally resemble the Small Heath in flight and could be overlooked if their presence was not taken into account prior to prospecting. 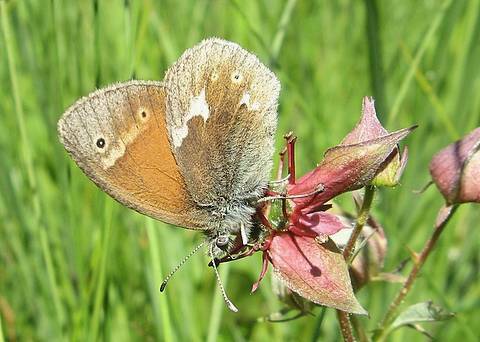 The Large Heath has a strong, white discal splash reaching from the costa to the centre of the underside of the hindwing and a series of ocelli which were generally weakly developed on these individuals from the Doubs in France but may be stronger in subspecies elsewhere.